Found mostly on 1983 - 1988 Gibson Les Pauls and other Gibson models that sported the Kahler made Gibson Super-Tune Vibrato system. This type straddled the G-bell truss rod cover. Very distinctive shape and design. This is a new replacement string lock that is an exact duplicate of the original with one exception... the material. The string lock was originally brass and as you may know, the bottom of the base would sometimes get punched out or bulged out from the excessive pressure of over tightening the clamping screw leaving a hole and no way to clamp that string. To prove this, simply remove yours if you have one and inspect the underside. Since these are no longer available anywhere so we took matters into our own hands. 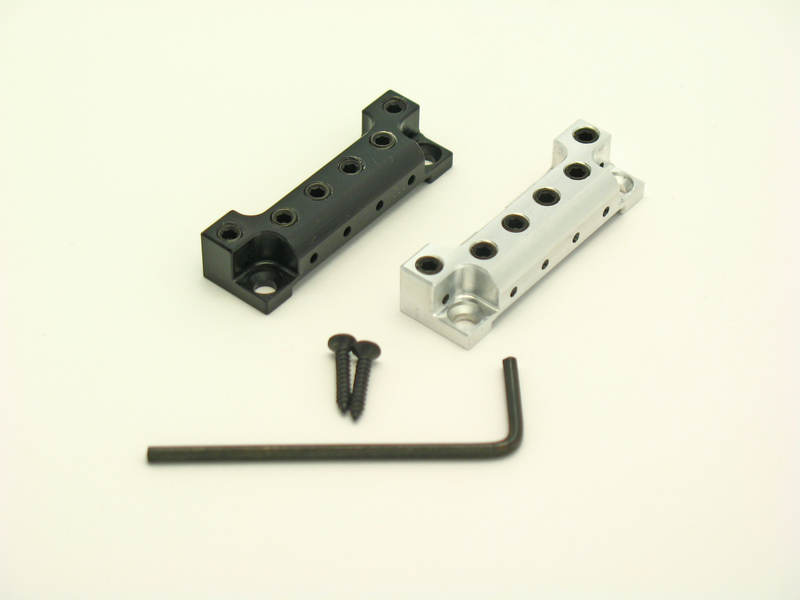 Whammy Parts made a replacement string lock made from a billet of 7075 military grade aluminum (3 times stronger than steel), same as our Fender System I and II and III string locks are cut from. Comes with all seen. Fits perfectly since it was made to the originals exact size.